How far would you go to protect your family? Please share with me in the comments! The phone rings and the offer is made, leaving you only seconds to decide. Betray your country or your family will drop dead before your eyes. KGB general Vasily Karpov is secretly restoring Russia’s superpower status by forcing elite Americans into traitorous acts of espionage and sabotage. Meanwhile his greatest coup targets Russia itself, where Karpov is conspiring to capture the Kremlin for himself. Former US soldier and spy Alex Ferris becomes the first to fathom Karpov’s grand plans. Racing from San Francisco to Siberia in a quest to uncover complex clues, Alex must elude ambushes, assassins, and death from exposure as he wages a one-man war against a growing global threat, and fights the resurgence of the Soviets. The door closed behind them with a hiss. General Vasily Karpov knew it was the hermetic seal, but he couldn’t help feeling that the room was scolding him for what he was about to do. From the opening paragraph to the twist at the end, Tim Tigner captured my attention and pulled me out of a month long reading slump, for which I am incredibly grateful. While Tigner’s writing style fondly reminds me of Vince Flynn and Brad Thor, the plot and action scenes are wholly original. His background as a Green Beret (Thank you for your service, Tim!) and current work in the medical device field lends credibility to the plot and makes each action sequence exciting and believable. As a former US Soldier, protagonist Alex Ferris has the specialized training he needs to covertly investigate Karpov in Siberia during the winter – brrrrr! This isn’t really a spoiler, but there is an unusual chase scene through the Siberian wilderness in a snowstorm and it might be my favorite part of the book! I won’t tell you what happens out there, but it was interesting to learn some unique survival tactics and see how the author could make Siberia a beautiful and fascinating location. I enjoyed getting to know hero Alex Ferris and hope Coercion is just the first in a series featuring him. 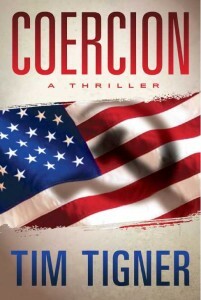 Fans of espionage thrillers will enjoy this well-researched, fast-paced novel. I’m excited to have another knowledgeable thriller author to add to my list of favorites and look forward to reading more of his work! Thank you TLC Book Tours for inviting me to participate in this tour, this was a fantastic book to close out my summer reading list! Thanks for being a part of the tour for this exciting read!